Bulb: 100,000 hour lifetime, hi-intensity Light Emitting Diode (LED), "solid-state bulb"
The ability to use AAAA-diameter cells from a relatively thrifty and very common Duracell 9V battery is nice, as AAAA standard cells aren't widely stocked. The surprisingly bright little LED draws more than a third of a watt (90mA) from fresh cells, and it shows colors much more vividly than standard incandescent flashlights do. Best $14 I ever spent! First, I've found all LED lights that make outragous claims of average battery life of dozens to hundreds of hours is either misleading or totally wrong... no matter what brand or where you bought them from. They either go totally dark in much less than half the rated time, or have gone too dim to even read large print with the light pressed closely to the page. To even get close to half the rated life, skip the alkalines, you must use expensive lithium or the highest capacity NiMi rechargables available on the planet. So they all lie about or misrepresent your actual battery life. I'm sure some of them, if you put the most expensive batteries in the world in them, run the light almost to their rated battery life, if you take them into a fully darkend room, & hold the light to your face, strain your eyes, you will find the LEDs are still glowing very faintly... but that's not useful light. I haven't found AAAA rechargables or lithiums, but you won't need them. This is the only LED light I ever found that doesn't give you bull on battery life. It uses a single LED & 3 AAAA alkaline batteries that can be obtained cheap from many sources. Slightly longer than an oridinary pen, I take it everywhere, & is always with me at work. As an engineer, I've used it several times daily for over 6 months with the original batteries. I thought it might be getting a little dimmer so recently put fresh batteries in it. Although it got brighter, not significantly, so I put the old batteries back in. This light just won't die. Lot's brighter than any keychain light, it's as useful as most big lights. It fell 14' from a ladder onto solid concrete, into puddles, snow, & got paint & glue on it. Using harsh chemicals & scraping to get all the paint & glue off, it still looks & works like brand new. I don't know what they used to paint that light with, but there's not a scatch on it anywhere... no dents yet either. Solid & durable. Your best light will be the one that works when you need it to, & is close at hand. Best $14 I ever spent! Streamlight Stylus is a very good pen light. It is surprisingly bright for a single-LED flashlight. And since it uses three AAAA sized batteries, the light won't go dead on you easily. Stylus has a light switch at the end of the body. The light burns as long as you keep the switch depressed. If you need to have your both hands free, you can twitch the endcap, so you have a constant on light. 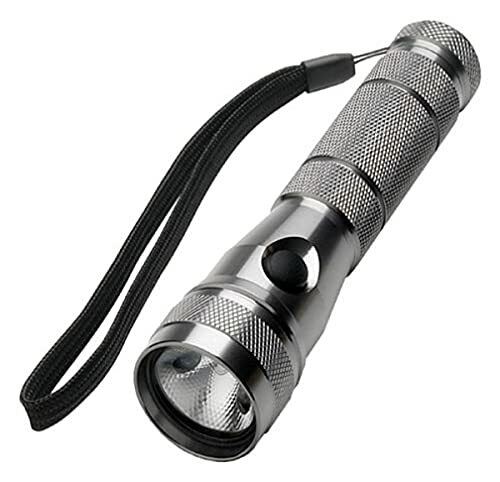 The body of the flashlight is very well made and durable, and the light switch has a good feel to it. Along with the light, you get a removable sleeve. When the sleeve is on, the light beam is narrower and more focused. If you need a wider beam, just remove the sleeve. My main gripe about the flashlight is that it is a bit too long. 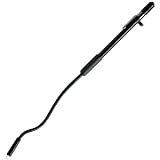 It will probably fit into your shirt pocket, but it is clearly longer than a typical pen. So, it is very uncomfortable to carry the light in your pants pocket, for example. If there were a Stylus that used only two batteries instead of three, I believe that would be a better penlight overall. And if you need a keychain -size flashlight, Stylus is naturally way too big for that application. This is really a terrific light. It uses LED technology whichtells you the following. The "bulb" is virtually unbreakable and appears to have an unbelievable work life (can you believe 100,000 hours). Run that on your pocket calculator see what that comes to in days and years. Next, even though the LED burns with a pure white brilliance, it is cool to the touch. This is the light I let my 7 year old niece use. Because LEDs draw little power compared to the light they put out,they don't need large batteries. The battery size is AAAA. This allows for a very light weight tool. If you need both hands free, you can hold this light in your mouth for a long time because of the light weight (no pun!) It also remains in your pocket forever without drawing attention to itself because of its size. Also of great importance is that this is not just a toy(even though it is fun!) It is a real working tool. I am a physician and this is my little exam light. It works great at examining eyes and throats. You may find it useful in dozens of situations. Because of its size it can go everywhere- home, car, shirt or jacket pocket, purse or briefcase and so on. There are also different colored bulbs for specialty applications I won't go into here. One of the complaints I have seen is regarding the AAAA batteries. First of all, the batteries last for a very long time because of the low power drain. You may never change the batteries. Secondly, the batteries are freely available at Walgreens which seem to be everywhere these days. They are in the specialty battery section with the hearing aid and photo batteries.I occasionally check and I have always found the AAAA's in stock. The major limitation is that even though it puts out a lot of light for its size, it is a "pen light". If you need to light a whole room up you will need a bigger light. Bottom line- this is a really great light. For the price, you can purchase several and leave them wherever you might need them. LED technology is revolutionizing flashlights in the 21ST century and these lights are classical demonstrations of advanced technology. They do more things:put out more light, use less electrical power, weigh less, are less likely to break, and cost less. Enjoy! The Stinger is a great rechargeable light. It's small yet provides a bright amount of light for about an hour. With the adjustable lens, you can choose a floodlight or spotlight. The Stinger comes with two charging cradles and an AC cord and DC cord so you can have one in your car and one at home. Therefore you can always have your Stinger charging to be used whenever you need it. The extra bulb in the tailcap is also nice. 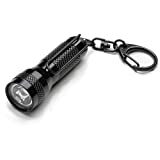 +'s: small, bright, fits easy in your hands, adjustable beam, 1 hour run time, you can charge the battery without taking it out of the flashlight, charging cradles allow you to place the flashlight from the top or "snapped" in from the front. -'s: long charge time unless you buy the "fast" charger. If you need to constantly use a flashlight that is small but powerful (security guard, handyman, plumber), the Stinger will not disappoint you. The rechargeable battery will save you money in the long run. Work with this. You'll love it. Two cons about this flashlight are it is a little heavy as it hold 3 C-size batts and the focus beam does not seem to achieve the standard that i want. Overall, this is great stuff!!! This is a true tactical flashlight which gives you three settings depending on your requirement. At the lowest setting this light is the most powerful flashlight I've owned. The smaller, low battery drain bulbs(3 or 6 burn setting) shoot powerful "blue" light like a science fiction laser ray gun. I use mine to walk my dog in evening. 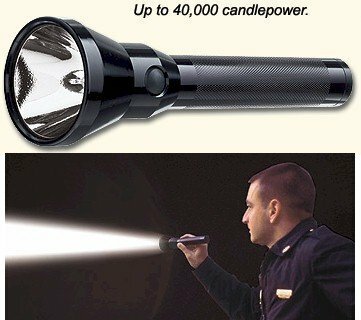 This torch really gets people' attention. Due to it's heavy duty construction it's a bit on the heavy side. But then this thing is sturdy enough to double as a small baton. Like a lot of people who will be looking at this light, I am a long time user of Mag lights. 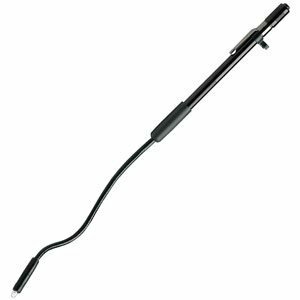 They are bull tough and well made.Well, this light is made even better, and the handle section offers a much more positive grip than a Mag (it even has a lanyard on the end). The Xenon light is brighter than my Mag of equivalent batteries - it does not, however, have near the range of focus that a Mag does.That isn't a huge problem as any 2 D cell is better used for fairly close work anyway.Leave the long distance spot for the 6 cell. There is plenty of light for lighting up a trail or barn. The Xenon will light up reflective trail markers for at least 200 feet, much further than you're likely to be able to see through brush or trees. As far as the LED portion of the light goes, I am very pleased.The switch has three lighting positions - 5 LED, 10 LED, and the Xenon, in that order.Under fifteen feet or so, there isn't much brightness difference noticeable between the 5 and the 10, but you can really see a change past that.On ten LEDs, the light is useful up to about 40 feet, more if you happen to be in a cave.Most of the time, I just use the 5 LEDs as I generally only need something for under 15 feet.This light will be great for catfishing - switch it to 5 LEDs and just leave it on so it's handy and doesn't get lost on the ground.And 5 LEDs are all you'll need to walk the most darkened trail.Battery life is long enough not to worry about running them down when using the LEDs. One little problem I have is with the lanyard.It's attached with a split ring to a permanently attached point on the base.It is not very stable to stand on end with the lanyard in place - it will do it, just tip easy.However, you can remove the lanyard from the ring and reinstall differently to make it easier to remove.During a power failure, it's nice to have a flashlight that can be stood up on its end.This one doesn't have the Mag's candle feature, but with ten LEDs bouncing off a white ceiling, it will give good emergency lighting for a room or used in a tent.Of course, the lanyard also gives you the ability to hang it overhead, which is difficult with a Mag. All in all, this is a worthwhile step up from a 2 D Mag, even at twice the price. I bought this flashlight in November of 2003. My intention was to purchase a high quality flashlight that would last a long time and I believe the Streamlight fits my requirements nicely. 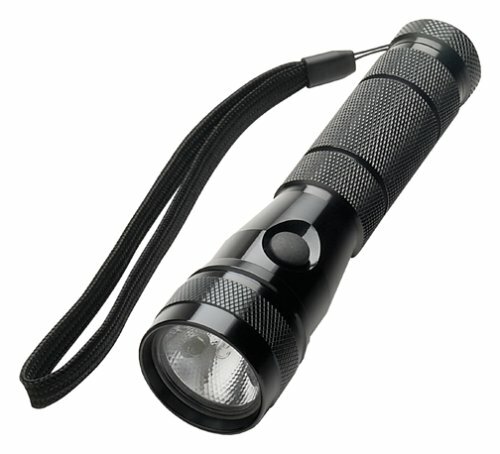 The construction is patterned after Mag-Lite's series of flashlights and is very solid. I have not been able to scratch the anodized casing. The LEDs are very bright and can be turned on 5 at a time or all 10 at a time. Usually, 5 is enough for anything I need to do. The xenon-bulb is unfortunately not particularly bright. 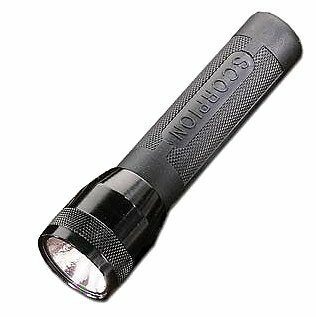 It's comparable to a Mag-Lite but not to some of the other high-power lithium-battery flashlights that you can buy. There is a rotating lens that can focus the beam but it only really works for the xenon bulb. For the LEDs, the lens only changes the beam from reasonably concentrated to very diffuse. I am sure it would be as effective to defend myself as an uzi if not better. I have the "titanium" version and it looks like a piece of [industrial] art. Excellent quality and price for a 200 lumens flashlight! One night I was fixing my speakers in the rear of the car. I used my Scorpion Streamlight to give me some extra light. For some reason I accidently left the flashlight on when it was sitting on the backseat. Meanwhile, several minutes later I smelled some burning and it was the Scorpion slowly burning a hole through my back seat. I was upset but surprised by the power of this little flashlight. Whenever I bust out this little guy out my friends react in awe by how much light comes from this little flashlight. I'm quite pleased but the batteries aren't cheap. My advice on batteries are to look for some on Ebay that run cheaper and buy in bulk. It has a nice rubberized grip for nice handling. I even hold it with my teeth when my hands are occuppied as I look at my engine in my car at night. 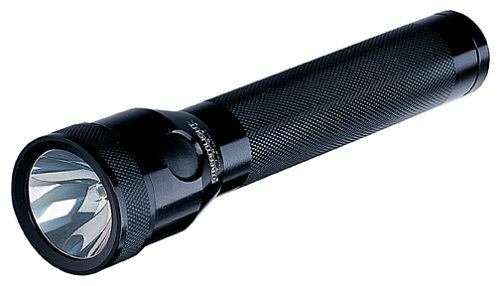 This flashlight kicks the shizzle out of a maglite but it really drains the batteries if you have it one for a long time. Streamlight Scorpion is a very good general purpose flashlight, as the light is bright, and quite even when the beam is set tigth. The light is easy to operate with tailcap end click-on switch, but there is no separate momentary switch. You can depress the click-on switch halfway down to get the same effect, but that is not as good a solution as a separate momentary switch would have been. The light is brigth with fresh batteries, but the light dims quite fast as the batteries are used. The light bulb heats up with constant use, and that can melt a hole into the plastic lens. That has happened twice to me, as the light has been clicked on accidentally without me noticing that. The light beam is adjustable, but when adjusted wide, there are some serious dark rings on the beam. The body of the flashlight is covered with rubber sleeve. I like the feel of that, although it is possible that the flashlight can stick to clothing when removed from pocket, but I haven't any problems like that. 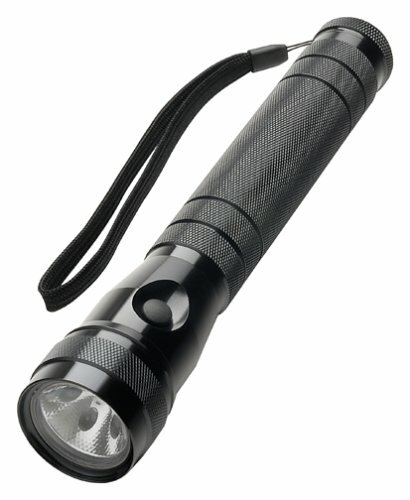 This flashlight is a very good choice for general purpose flashlight, and the price is reasonable. It is not suitable for a tactical light (for law enforcement, for example), mainly because it has no momentary switch. The Streamlight Scorpion is a small light that puts out a lot of brightness for its size. Powered by 2, 3-volt lithium batteries this flashlight is pretty small (both in diameter and length). You'll be amazed how such a small flashlight can light up a room or an object at night. The pushbutton switch is on the bottom of the light, so that might take getting used to. It's a three function switch (on/off/momentary on). The body of the flashlight is coated with rubber, so it's easy to grip if your hands are wet. However, this makes it difficult to bring out if you keep it in your pants pocket or a holster. The beam quality is nice: no "holes" or "rings" in the spotlight. Pluses: small size, bright light, manufacturer with good reputation for quality, lithium batteries have 10 year shelf life. Minues: Takes 3-Volt lithium batteries (can be expensive), flashlight is fairly expensive. This is a good light to keep in the car glove compartment for emergencies because it's small and the lithium batteries will keep for a long time. This Streamlight is brighter than a Surefire, cost less and has a longer battery run time when turned on. 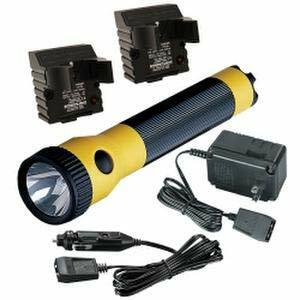 I have looked all over the internet for the best price on 3 volt lithium batteries for my Streamlight Twin-Task 2-cell lithium flashlight and Surefire does offer the best deal(surprised) 12 3-volt lithium batteries for $$$ at [online] . The 2nd best deal is [online] for those people who are interested. I don't know what that guy from White Plains, NY USA is talking about. 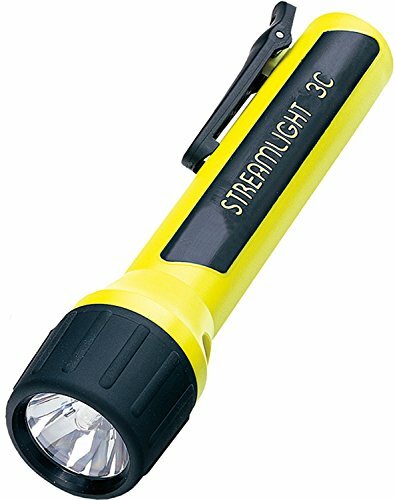 This Streamlight Flashlight has 72 lumens(about 43,333 candle power)of brightness, Last 2.5 hours with full brightness and 28 hours with the 3 LEDs when Surefire flashlights come with 65 lumens(39,000 candle power) of brightness, 1 hour of use and no optional LEDs(and never will, streamlight has a patent on there dual LED/xenon flashlights). The price is also great for this flashlight and much cheaper than Surefire. I use this flashlight for everything, I just gave one to my nephew for his birthday, he is an Explorer for San Fernando P.D. and he loved it, especially the two choices of brightness for different situations. The only thing that is true about this great flashlight is the adjustable beam does not work that good but the light does not even need adjusting it is perfect the way it is. Surefire does not even offer this feature but both lights have the same style light beam. I also own a Streamlight rechargeable Ultra Stinger and I could not be more happier with this flashlight, it has 75,000 candle power(the power of this light is incredible) and a adjustable floodlight that does work very well. I think Surefire flashlights are a little over rated for the price they charge. If you want a good quality flashlight that is just as good as Surefire if not better than get a Streamlight for half or more off the price than a Surefire. Please check out the review I wrote on this model under Sporting Goods or click on "more about me". A great all around flashlight with the advantage of being able to conserve the batteries when using the LED mode. The Xenon bulb is not as bright as it's cousin, the Tactical TL-2 Xenon model only. This is the one I picked for camping, power emergencys,& to keep in the car for emergencys. I use the other model mentioned for self protection at night for it really puts out a brighter & intense light which will temporarily blind an attacker in the dark. These were recommended to me by a law enforcement officer. 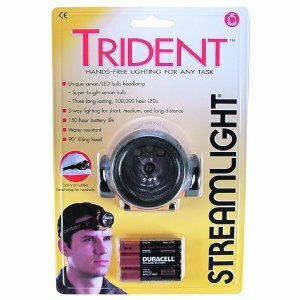 I cant say enough about the products from streamlight. I purchased this light about 3 months ago & couldnt be happier. The light features both LEDx3 and Xenon bulbs. The LEDs work great for some basic flood lighting when you are trying to find something in the dark. The Xenon comes in handy when you are doing something specific and need to see every detail. Like I said, I have had it 3 months and havent replaced the batteries yet with moderate use. Everything is manufactured to the upmost extreme. The case is very durable aluminum with titanium or black coating. The lens is hard to break, I have dropped mine once or twice without even a scratch. The button is also very simple and ergonomic, much like a MAG. For someone looking to buy this flashlight, I would also recommend the 2D model. It is 2.5 inches larger, but has 10 LED's and lasts 3 times longer. Features three levels of lighting and up to 120 hours of continuous run time. This Streamlight Flashlight has 72 lumens(little over 43,000 candle power)of brightness, Last 2.5 hours with full brightness and 28 hours with the 3 LEDs when Surefire flashlights come with 65 lumens(39,000 candle power) of brightness, 1 hour of use and no optional LEDs(and never will, streamlight has a patent on there dual LED/xenon flashlights). The price is also great for this flashlight and much cheaper than Surefire. I use this flashlight for everything, I just gave one to my nephew for his birthday, he is an Explorer for San Fernando P.D. and he loved it, especially the two choices of brightness for different situations. The only thing that is true about this great flashlight is the adjustable beam does not work that good but the light does not even need adjusting it is perfect the way it is. 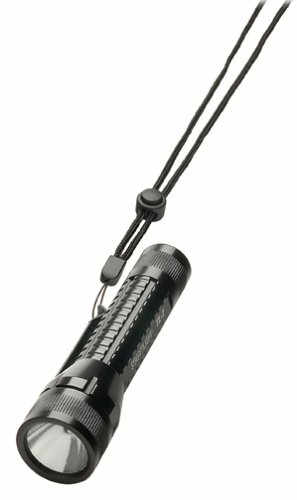 Surefire does not even offer this feature but both lights have the same style light beam. I also own a Streamlight rechargeable Ultra Stinger and I could not be more happier with this flashlight, it has 75,000 candle power(the power of this light is incredible) and a adjustable floodlight that does work very well. I think Surefire flashlights are a little over rated for the price they charge. If you want a good quality flashlight that is just as good as Surefire if not better than get a Streamlight for half or more off the price than a Surefire. I have looked all over the internet for the best price on 3 volt lithium batteries and Surefire does offer the best deal(surprised) 12 3-volt lithium batteries for $15.00 at www.surefire.com . The 2nd best deal is on www.Ebay.com . This flashlight gives you the choice of an LED low light with a 28 hour battery life or a brighter Xenon light with a 2.5 hour battery life. This flashlight is not as bright as the Scorpion model or the Tactical TL-2 Model. (It runs on 2 lithium batteries) The Led light would be great for reading when the power is out, or to conserve your batteries if you need to! Plus you have the option of the Xeon light for when a brighter light is needed. It has a lifetime guarantee plus a 30 day money back guarantee if not satisfied with this product. Highly recommended! The Twin Task is made in China. The Tactical TL-2 is USA made! I can hold this entire light in one hand--it is that compact. Very light weight, also. Yet the light output is superb. In the 3 LED mode it gives plenty of light to find your way around the house or walk outside. It is rated for 28 hours for this function (compare that to any incandescent light). The Xenon beam is very even with no rings and more of a flood light than a narrow "beam". Is very good for medium range, but not for longer range tasks (like 100 yards+). The only disadvantage is that it takes relatively more expensive lithium CR123A batteries. These can be expensive to buy at retail (at $4 to $5 per battery) but can be acquired for less than half of that if you look on the internet. The advantage of the lithium batteries is in compactness and better brightness over the battery life. The only disadvantage is the cost. If you are looking for a great all around use light, that never needs a replacement bulb, then this is a great one. Well made and bright. An extremely bright USA made flashlight. This is the most amazing flashlight I ever had. 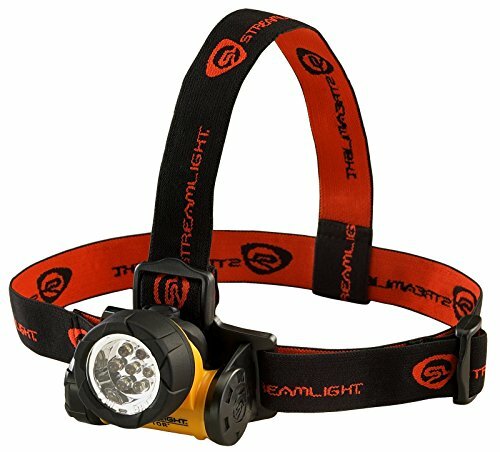 In my opinion, it beats Maglight and every flashlight I have ever used hands down! This puts out such an intense light it can temporary blind an attacker which makes it very useful for self protection at night! I would not let a child play with one of these for they are that bright. It has an adjustable focus beam, a removeable metal pocket clip and a lanyard to use on your wrist if needed. This was highly recommended to me by a law enforcement officer. Lithium batterys cost more than alkaline batteries but you can get them for as low as $15.00 for 12 on the internet plus S&H. (CR-123 Lithium) It uses 2 batteries in 1 hour but just keep some extras and brighten up the night! The shelf life of a lithium battery is 10 years. It is close to the size of a 2AA flashlight but do not let the size fool you. Make sure you have one of these in your hurricane or earthquake preparedness kit! I would consider the Litebox as a "lantern" and not a flashlight. My definition of a lantern is that they are usually larger and can't fit into your pocket. Although it's fairly large and heavy (due to the battery), you can't go wrong with this bad boy! Supposedly used by many fire departments, I can see why they use them: Heavy duty plastic casing, comfort handle, thin penetrating beam (although you can buy different lamp modules so you can have a broader beam), long run time. 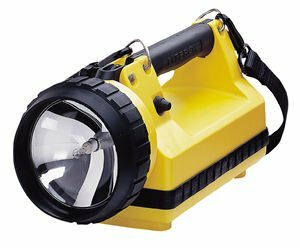 The head can also swivel up and down, so it can be a good work light.